My son and I made this EVERYTHING Omelette! 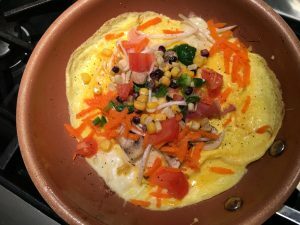 This omelette recipe has just about EVERYTHING in it, and I’m not just talking about the filling inside. Although it’s loaded with yummy goodness–mushrooms, spinach, carrots, sweet corn, bean sprouts, tomatoes, salty ham and three types of cheese–like all our recipes, it is about so much more! 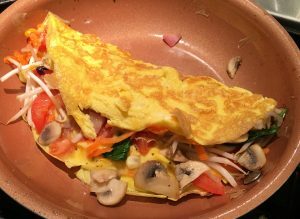 Here’s what I mean…he’s learning to cook, we are spending time together, working as a team, practicing patience, sharing laughs, caring, respecting, and celebrating our delicious omelette –now that’s a mouthful! It’s not necessarily easy, it took us 3 tries to get this omelette right, and we are still working on our relationship, but EVERYTHING worthwhile is worth the time and effort. We are building our relationship one recipe at a time! 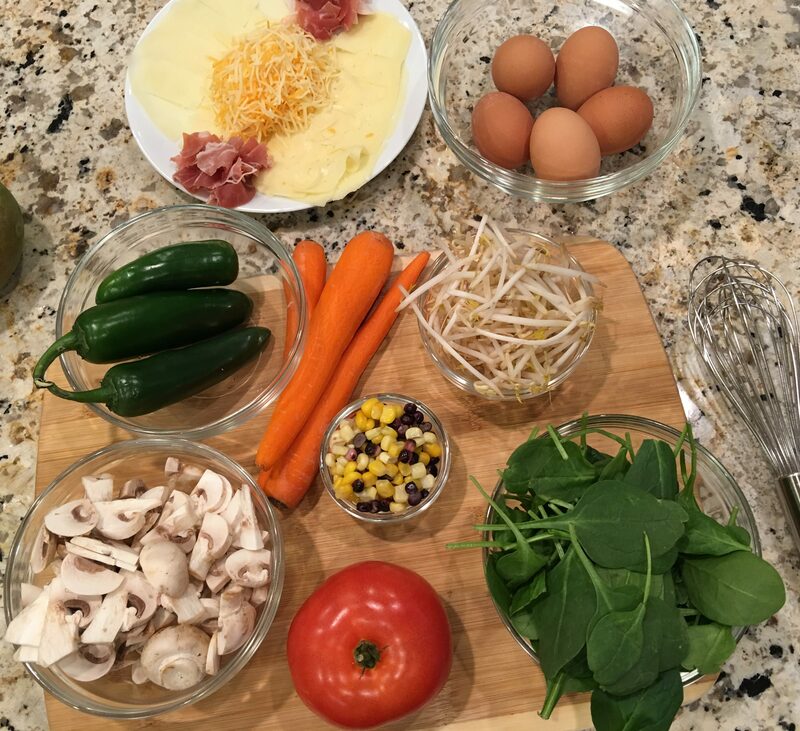 Here is the recipe for our Everything Omelette. You can use our recipe or make your own. As for relationships, each one is definitely unique, so you will have to try different ingredients until you find the recipe that works for you. Break all 4 eggs into a bowl and beat with a fork or whisk until well combined. Add a splash of milk to the eggs and whisk together. Heat 1/2 tbs of butter in an 8" omelette pan over medium-high heat until butter is sizzling. Add spinach and mushrooms and sauté for 2 minutes until softened. Remove to a small bowl. Add another 1/2 tbs of butter to the pan and heat until sizzling, swirling to coat the bottom of the pan. Add half of the beaten egg mixture to the pan. Let set for 15 seconds and then begin lifting the edges one at time while tilting the pan towards the lifted edge, letting some of the egg run under the edge. Do this with a few more edges until the omelette is just set. Quickly spread half of the filling ingredients evenly over the omelette, ending with a layer of cheese. Fold the omelette in half, lifting one side and folding it over the other. Let it warm for a minute and then slide onto a plate. Repeat for the second omelette.